Monmouth, the capital of Monmouthshire, is situated at the confluence of the rivers Wye and Morrow. 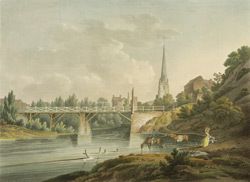 William Coxe, a clergyman who visited here around 1801 noted that "near a picturesque bridge over the Morrow, the scene is peculiarly wild and romantic; the spire of the church and the remains of the priory are almost the only objects which rise above the thick mantle of wood". The bridge over the river leads onto a broad street heading to the town market place and town hall.